﻿ Amrap's AirIt | Australian Music Radio Airplay Project :: Electronic :: Mildlife - How Long Does It Take? Amrap's AirIt | Australian Music Radio Airplay Project :: Electronic :: Mildlife - How Long Does It Take? Acclaimed Melbourne outfit Mildlife return with news of their signing to Inertia Music, as well as the release of a brand new single and limited edition 12", ahead of their fast-selling April tour dates. ‘How Long Does It Take?’ is a pulsing dark-matter-powered locomotive plowing through the upper atmosphere. The B-side of the 12" comes with two remixes direct from the originator of Cosmic Disco Daniele Baldelli and his partner in crime Marco Dionigi. Their debut LP Phase (Research Records) sold out it’s 1st pressing instantly and won them the award for Best Electronic Act at The Age Music Victoria Awards as well as a nomination for Best Independent Jazz Album at the 2019 Air Awards in July, as well as praise from iconic DJ and BBC6 radio presenter Gilles Peterson. Furthermore, they sold out their debut Australian tour in May, before heading to the UK and Europe, and returning home for a triumphant set at Meredith Music Festival in December. 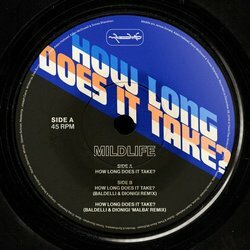 Taken From The Release Titled How Long Does It Take?